You won't be surprised to hear that the socks I started knitting on holiday are now finished. You won't be surprised, because of the picture I showed you of the socks being nearly finished! Well, now they are finished and I have pictures to prove it. 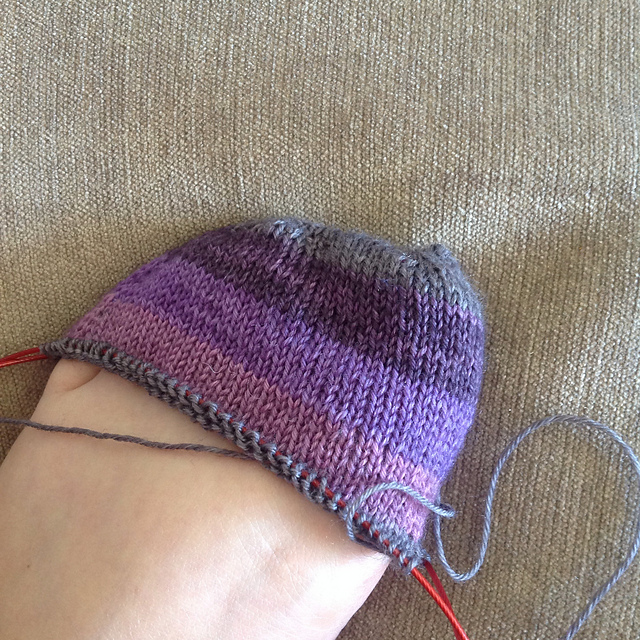 You will be bored of hearing that I used my own personal vanilla sock pattern, designed to shape each toe as a mirror image, making the right foot 1/4" longer than the left and the Fish Lips Kiss Heel thrown in for good measure. You will also probably remember that there is some calf shaping 4" after the heel is turned, which followed by working 2" of a 1x1 ribbed cuff, finished by binding off with Jeny's Surprisingly Stretchy Bind Off. I love how brainless this plain vanilla sock pattern has become for me. The only thing I have to look up is the shaped toe, and to be honest that is almost known off by heart now, I just check to make sure. 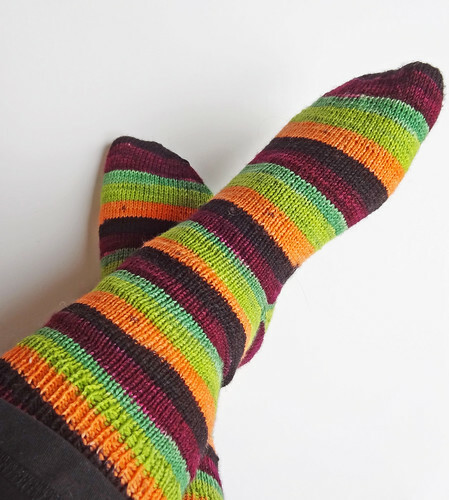 This sock pattern is perfect for my feet, ankles and legs. I don't like to mess with things that work and fit so well. The yarn, if you can't be bothered to look at my initial post about these socks, is from Desert Vista Dyeworks, and is the Viso base, 75% merino and 25% nylon, 4 ply weight, but with a good yardage of 462yds/422m. The colourway is Peter Max. I really love this colour. It feels kind of Autumnal to me. The yarn is very squishy and soft, so the socks feel gorgeous on. 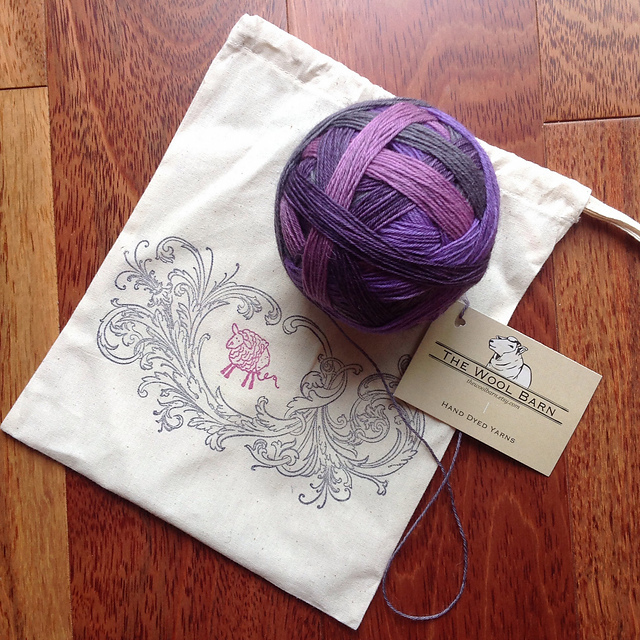 If ever I get another discount code, or sale, I will get this yarn again, provided I don't have to pay the customs charges! 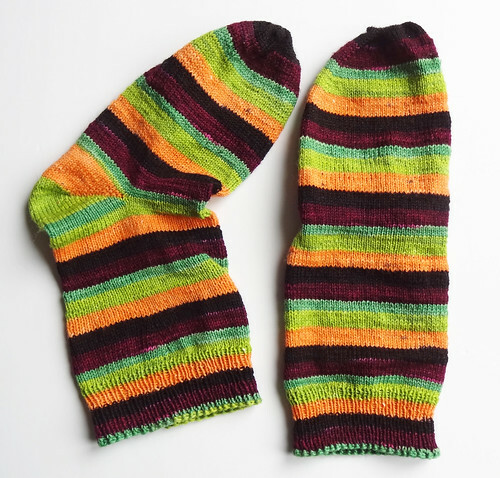 Of course, with my nice vanilla striped socks finished, I had to put some more socks on those sad and lonely needles. I decided to use something a little different, Superwash BFL (Blue Faced Leicester) yarn, with no nylon! It feels like a bit of a risk, but BFL is a sturdy fibre and I am not hard on my socks. It's because I don't go out very much, so the socks are really used mainly as slippers. The yarn is from The Wool Barn and is in the Goth Girl Rehab colourway. It weighs 100g and measures 400m/437yds. I've not come across this dyer before and I can't remember how I discovered her shop. It might have been a random search for self striping sock yarn, or a recommendation from someone else's favourites. I don't know, but this yarn is very pretty. The bag it came in is gorgeous! Look at the little sheep having it's fleece unravelled! It's a really nice touch to get a hand wound ball in a little fabric bag, that has been hand stamped. The colours are lovely and knitting with this yarn is a lot of fun. It feels silky, but strong, and I think it's going to make great sock yarn. Even if I only have a toe, for now. I shall pick this pair up when I need some mindless knitting. There is no hurry to get it done, but I do like to have a toe cast on, so I can just pick up the project bag and walk out of the door, knowing I have something mindless to work on. Of course, I have a lot of socks, this is the 13th pair I've cast on this year! Who knows, maybe I might be persuaded to cast on for someone else at some point, but I'm not holding my breath. You can never have too many socks, in my humble opinion, especially if they are hand knit, designed to fit perfectly and in lovely yarn!